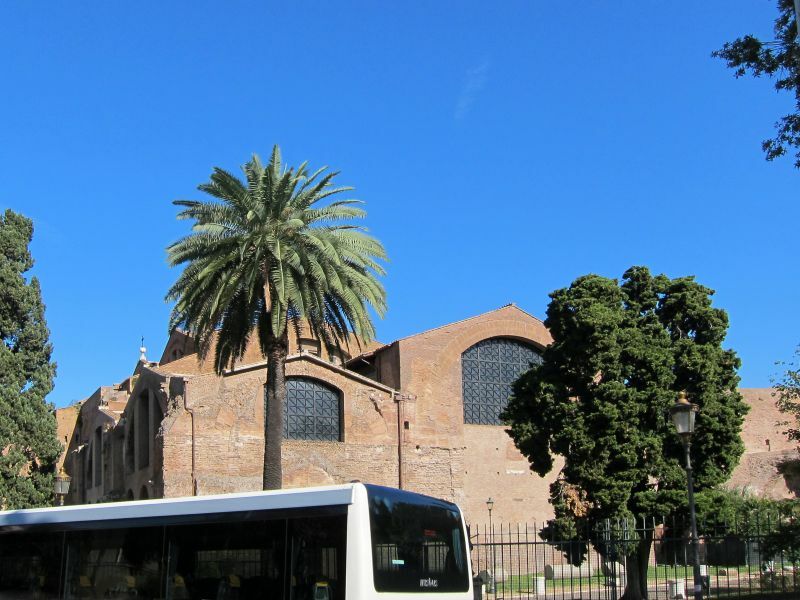 The Baths of Diocletian (Thermae Diocletiani) were public baths in Rome, in what is now Italy. Named after emperor Diocletian’s Baths and built from 298 to in 306, they were the largest and most impressive of the imperial baths. The project was originally commissioned by Maximian upon his return to Rome in the autumn of 298 and was continued after his and Diocletian’s abdication under Constantius, father of Constantine. The Baths occupy the high-ground on the northeast summit of the Viminal, the smallest of the Seven hills of Rome, just inside the Agger of the Servian Wall. They served as a bath for the people residing in the Viminal, Quirinal, and Esquiline quarters of the city. The Quadrigae Pisonis, a 2nd-century monument with various reliefs, some private homes, and a relief representing the temple of Quirinus once stood at the site but were demolished to build the baths. The water supply was provided by the Aqua Marcia, an aqueduct that had long served the city of Rome since the early 2nd century. To properly supply the baths, the supply of water to the city was increased under the order of Diocletian. The baths may have also been supplied by the Aqua Antoniniana, which was originally positioned to supply Caracalla’s baths in the early 3rd century. The Baths were commissioned by Maximian in honor of co-Emperor Diocletian in 298, the same year he returned from Africa. Evidence of this can be found in bricks from the main area of the baths, which distinctly show stamps of the Diocletianic period. These, according to the ancient guidebook Mirabilia Urbis Romae, were known as “Palatium Diocletiani”. This evidence shows the effect of the massive project on the brick industry in that all work by them was redirected and under control of the emperor. Building took place between the year it was first commissioned and was finished sometime between the abdication of Diocletian in 305 c.e. and the death of Constantius in July 306 AD. The Baths remained in use until the siege of Rome in 537 when the Ostrogothic king Vitiges cut off the aqueducts. One of the four inscriptions around the main entrance to the Baths of Diocletian reads, translated from Latin, “Our Lords Diocletian and Maximian, the elder and invincible Augusti, fathers of the Emperors and Caesars, our lords Constantius and Maximian and Severus and Maximin, noblest Caesars, dedicated to their beloved Romans these auspicious Baths of Diocletian, which the divine Maximin on his return from Africa ordered to be built and consecrated in the name of his brother Diocletian, having purchased the premises required for so huge and remarkable work and furnishing them with the most sumptuous refinement.” The baths take up 120,000 square metres of the district, which is about the same size as the Baths of Caracalla. The central hall of the baths was 280 by 160 metres; from it were derived plans for the Basilica of Constantine. 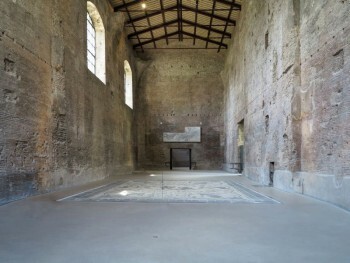 However, the capacity of the Baths of Diocletian was said to be much greater in comparison to the Baths of Caracalla. This could be because the entrance and rooms were made larger than its predecessor in block size, which allowed more space and functionality. According to Olympiodorus, the baths were able to hold up to 3,000 people at one time. However, this claim is disputed because Olympiodorus never mentioned how he came about this figure in the first place. The caldarium, or Cella caldaria, was rectangular in shape with many octagonal rooms found near it in the corner of the structure. 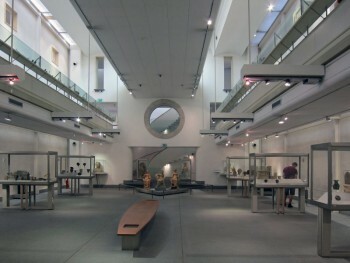 The area seemed to be referencing the older baths of Nero and Titus in its initial design. What set this caldarium apart was the sheer scale of the room compared to its predecessors. It continued a basilica-like theme from the frigidarium with a cross-vaulted middle bay and three projecting apses. These architectural techniques created the feeling of a more open space for the patron. Dressing rooms, also known as apodyteria, were located on either side of the calderium. Along the sides of the caldarium were private rooms that are believed to have had multiple functions, including private baths, poetry readings, rhetoricians, etc. 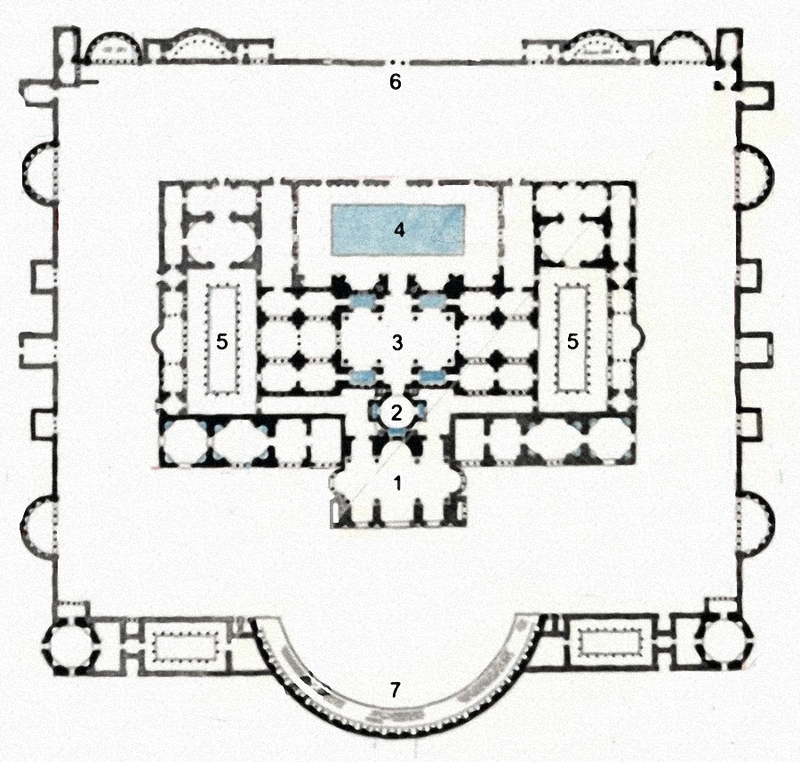 Other areas attached to the caldarium were a garden, lounging rooms, gymnasiums, and small halls and semicircular exedrae used as lecture and reading rooms. Within the frigidarium, the use of external buttresses for the cross vaults were considered by some to be the first example of the scientific system of thrusts and counter-thrusts in architecture. Concerning the baths as a whole, it has been described as evoking the Imperial style, or a “Classical” image, which is the style of “manipulation of space”. To manipulate the space within this style, the forms of the building were simple and give the impression of a vast amount of open space. The builders of the baths used different techniques to create this effect. The exterior walls of the bath were encrusted with stucco to give the impression of stonework. This technique was quite common within the structures built during the Imperial style of Roman architecture, e.g., The baths of Constantine, the Basilica Nova, and parts of the Sessorian bridge. The interior parts of the bath were supported by vaulting ceilings and arches to create curvilinear lines. The structure of the roof is an excellent example of Classical design. Architects used sloped forms to cover curved extrados (the outer surface of the arch) of the vaulted halls.